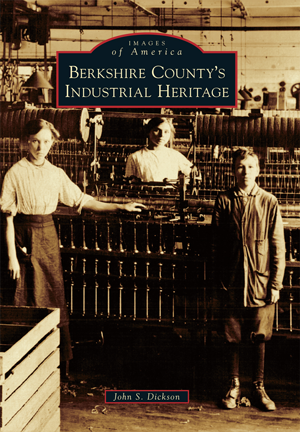 Evidence of bygone industrial prowess is scattered across Berkshire County in the far west of Massachusetts. Better known now for its four-season tourist attractions like beautiful scenery, cultural venues, and outdoor sports, the region was once home to an industrial base that helped a growing nation meet its needs in textiles, paper, glass, iron, and a variety of other products. The relics—imposing brick buildings just off the main roads—tell a story of enterprising young men and women harnessing the power of the area's rushing streams to make products and profits. They were inventors and adopters of technology, and they gave back to their communities. Recurring waves of immigrants flowed into the county to take their places at the machinery and try to make a living for their families. John S. Dickson mined the archives of the Berkshire County Historical Society for the bulk of the images presented here. A retired diplomat, Dickson earned a master's degree in public history from UMass Amherst. He is chair of the Pittsfield Historical Commission and a board member of the Berkshire County Historical Society. He lives in Pittsfield in a house once inhabited by textile workers from the nearby Pontoosuc Woolen Mill.